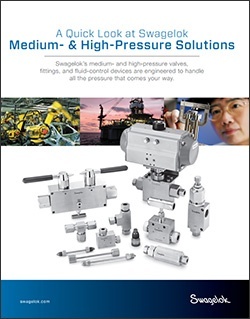 Swagelok’s medium and high pressure valves, fittings, and fluid-control devices are engineered to handle all the pressure that comes your way. Standing up to the pressure starts with a legacy of quality and ongoing innovation backed by unmatched expertise. Swagelok Company is a long-time designer, manufacturer and provider of high-quality fluid system products, assemblies and services, all of which help make our customers successful. And that success comes without compromising the safety of those working in high-risk environments. Our products and services are readily available through a dedicated network of more than 200 authorized Swagelok sales and service centers in 70 countries, giving you the global reach of our fluid system knowledge tailored to your local market. Simply fill out the form, the download link will appear once the submission is completed. Thank you for your interest.